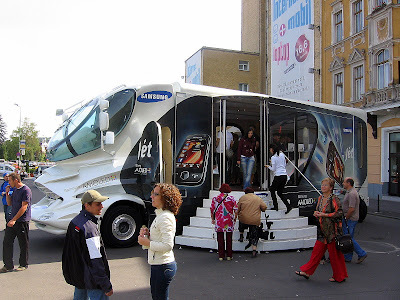 ...and in case you want to be up to date with the latest gadgets here's the samsung showroom on wheels . i don't care for mobile phones or even buses but this strange looking automobile is interesting , especially the front and the driver's seat. 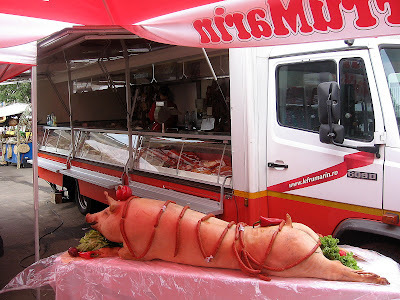 it was parked in front of the "aro hotel" last week . 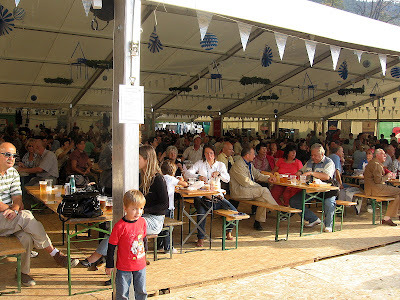 last weekend we celebrated here the "harvest day". many years ago this used to be quite a big deal but not anymore . it used to be a real fair and it felt special , maybe because it was one of the few . 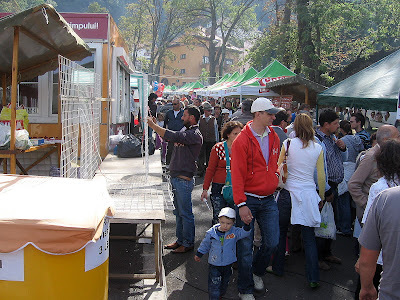 now , our autumn habits have changed and this fair is nothing but some decorations in the city markets (by the way , brasov has 6 markets but only 3 important ones : star ; dacia ; astra) a little bit of food (meat+fire=love) a little bit of drink (must and wine) and a little bit more fruits and vegetables on the stalls . but the feeling is lost and this year the whole thing was pretty quiet. 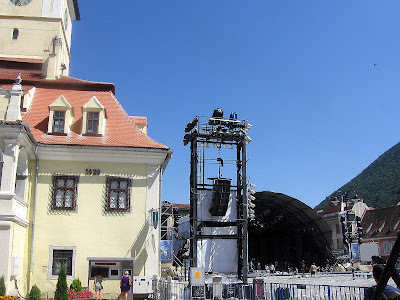 3 weeks ago , between 2 and 7 september the "golden stag" was once again visiting the old council square in brasov . 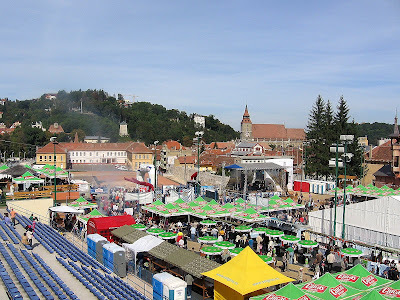 it's a pop music festival and international contest started way back in 1968 . after only 4 years the communist regime decided it's too much freedom and too much joy so a long silence of 19 years ended in 1992 when the festival moved in the square . 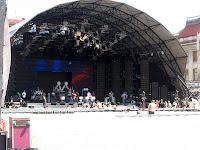 since then , almost every year we have a week with a lot of music and a great summer atmosphere . 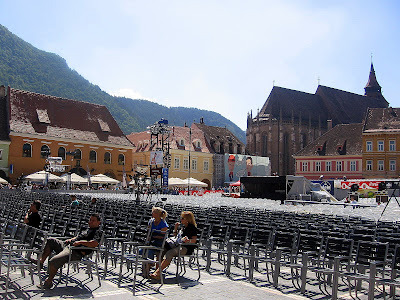 it's definitely one of the best times to visit brasov (if you can find a place to stay). 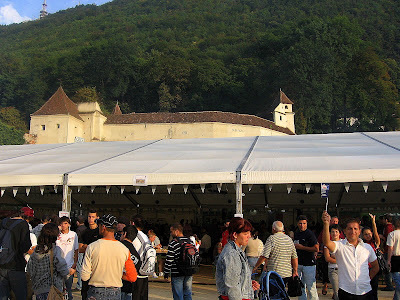 the festival has 2 parts , an international contest and guest performances of romanian and foreign stars. 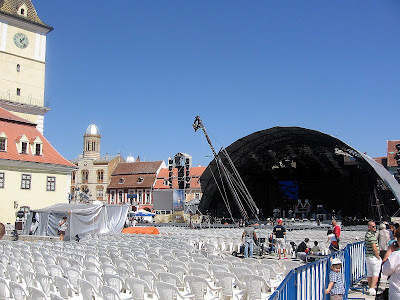 during the years a lot of well-known artists perform live in brasov and a funny fact , even christina aquillera partipated in the contest before she was a big star. 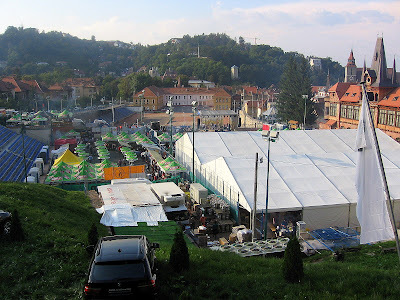 during the festival the old town is vibrating with music and more . it's a great time and if the weather is good . like it was this year , it's sightseeing during the day , concert in the evening and party after hours . 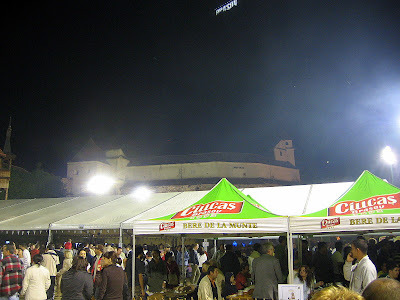 of course , a lot of stalls with snacks and souvenirs , other connected events , all the bars . cafes and restaurants with outside tables are trying to cash in , the prices are slightly higher , more visitors and tourists ... and so on . 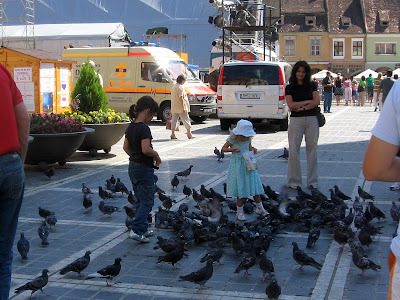 but it's something in the air , brasov becomes a place where you like to live. 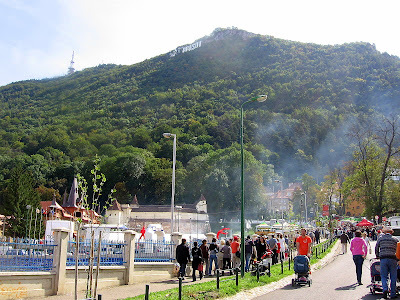 every tourist in brasov has a picture with this building . 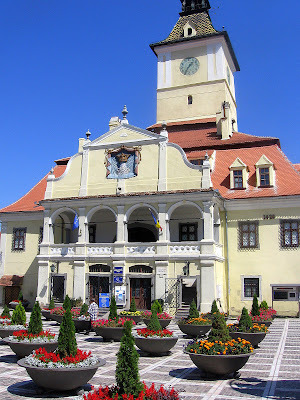 this is the center of the old town , the old council house . because it's more than 500 years old during its life it use to have different functions and now is part of the brasov history museum . 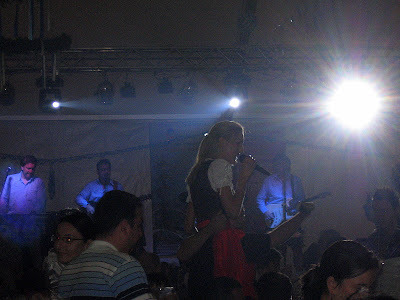 this picture was taken during the "golden stag" pop music festival 3 weeks ago . 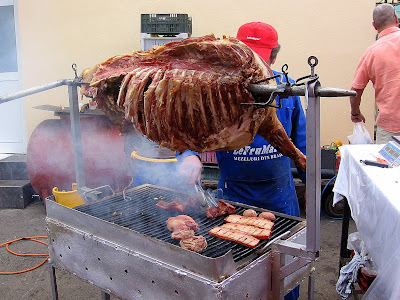 i'll show you more about this festival tomorrow . so . how was it ? unfortunately i only have one good thing to say about it : the atmosphere was great ! it was a real party and you can see that the people really need this kind of fair . 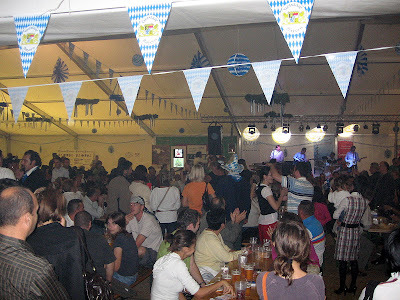 the german band (wirbelwind) really fit the event with their old euro-pop covers and drinking songs , most of them in german of course (they have a lot of experience with this kind of beer festival) and they were the best part of the fest . 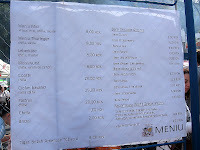 other than the atmosphere ... a lot of snacks : mici ; sausages ; ribs ; trout on a stick ; prezels ; crepes ; waffles ; donuts ; caramel apples ; popcorn ; boiled corn ; cakes ; gingerbread and many more but the real food was far from the german quality promised by the organizers and it was quite expensive . for the drinks , they only had 5 types of beer , none from germany and it was not so good and more expensive than at a restaurant and they only used plastic cups . 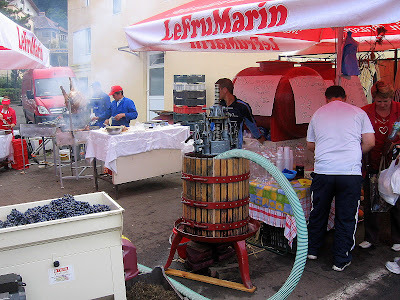 also some sodas , fresh orange juice , cocktails , must (unfermented new wine) and mulled wine / gluckwein and coffee . the location has a great view and very nice surroundings but too small and crowded and also the service was poor and unfriendly , probably they were overwhelmed by the crowd but an incredible thing happened , after the first day when they saw it was quite a success , some of the prices were higher . i can't wait for the next year and hopefully it's gonna be a lot better . 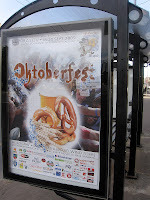 Oktoberfest is in Munich and is still on till october 4 , but Brasov has (first time this year) a little oktoberfest . Maybe not a big one but the newest one and the one with the best landscape and view ... hahaha . But it was very short , 18-20 september only. 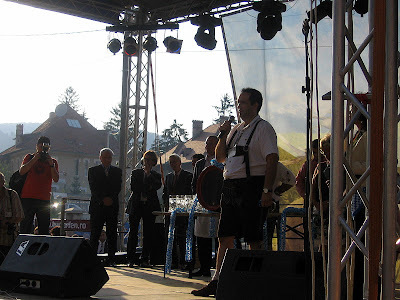 We used to have beer festivals before but this time it was a strong german touch including the consul of Germany in Romania and the mayor of Nuremberg , a german band and supposedly german food .